I started my blog three years ago because I was mad about my student loan debt. I didn’t have just a little bit of debt.. I graduated law school with $206k in debt (from law school and undergrad). Yea, it’s a lot — I know. I was so confused how I managed to make it to age 25 as an attorney and know nothing about money yet have that much debt. I was mad and felt like it had “happened to me” that I wanted to help prevent this type of debt by educating young women like myself who stereotypically aren’t interested in money learn about money. Instead of feeling like a victim, I wanted to be proactive and come up with a solution. Starting a blog was my solution. I started a blog (I called it Financegirl) with the hope of inspiring young women to take control of their money. I knew nothing about blogging and didn’t even read blogs at the time. I don’t know why I thought blogging was a good idea, but I just went for it. Little did I know that my blog would allow me to switch careers and do something I love, make extra money to pay off my debt, and teach me so much about entrepreneurship, leadership, and business. The first 2 years of blogging I was all over the place figuring out the ins and outs of blogging, including how to write good content, how to run a WordPress blog, how to market and sell online, and how to teach people about money. The hardest part for me during this time was finding my voice. During this time, I realized I really liked helping people with money. At the same time, I didn’t like practicing law (or the complete lack of work-life balance in my life). So, I quit my job as an attorney to pursue a career in financial planning. This was a very easy choice at the time because I had grown to hate law so much (and not really law as a study, but the culture of being a lawyer). It did mean taking a 50%+ pay cut, though, which was the worst part of the transition. But, I knew that I needed to be aligned with my work and doing something I love, so I believed I would figure out the money along the way. I also believed I could continue to blog on the side and hopefully use that money to pay off my student loans. So, that is what I did. I also took Elite Blog Academy (a blogging course for beginners) by Ruth Soukup during my second year blogging. The course was the biggest influence on my rebrand and blog growth. If you’re a blogger, you can grab her free Blog Structure Blueprint that I used to re-structure my blog. It shows you how to think of your blog from the readers perspective from an organizational standpoint. This is what I used to redo my entire blog. When I entered my third year of blogging, I was done with my career transition and didn’t have other major priorities outside of work and my blog (no more studying after passing the CFP® examination – yay!). This allowed me to really dig in deep to my blog – and it paid off. In my third year of blogging, my brand became more clear, my writing became better, my income went up, and blogging just got easier. Most importantly, I learned how to connect more with my audience and give them amazing content while being my authentic self (the ultimate goal of blogging). 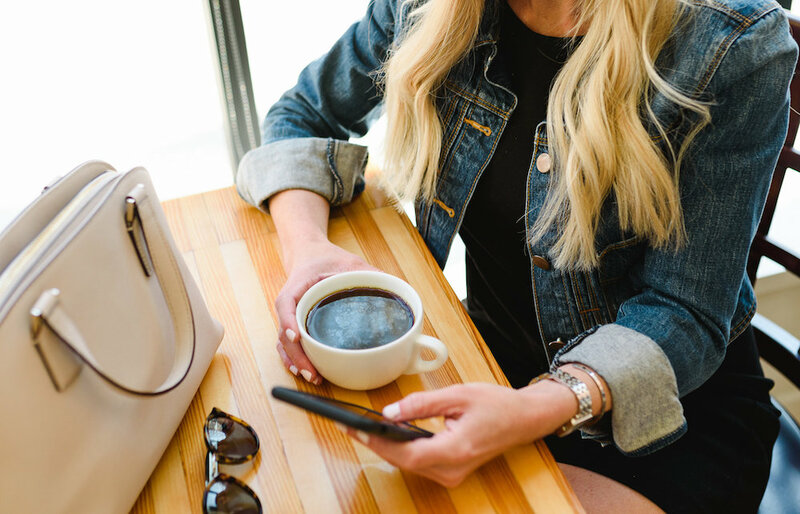 I took Six Figure Blogger (a course for intermediate bloggers on how to monetize a blog), and it’s been the key strategy to me making money blogging now. My primary reason for blogging is that I love it. I enjoy teaching people about money, career, personal development, and blogging topics. Then there’s the business side and the tech side of it that I enjoy, too. It’s fun for me. So, while I do need to make money from my blog to cash flow my student loan payments, I also really enjoy it, so it doesn’t feel like work. This makes getting up at 5am to blog before work easy. Truly, I am excited to get out of bed every day. I love learning and growing, and the online world is the perfect place to explore. That’s why I do it – I love it. When I first started blogging three years ago, I didn’t know you could make money blogging. As I started to build my audience and got to know other bloggers, I learned quickly that people make money blogging – a lot of money. My first year blogging, I made roughly $8k. My second year blogging, I made roughly $30k. These numbers are gross, meaning I have to pay expenses and taxes out of those numbers, so it’s not like I took home $30k or anything. But still! I was able to use the money I did take home to pay off my debt since I switched careers. I’ve paid off over $100k in student loan debt so far, and it wouldn’t be possible without my blog. I would be negative $1k in my budget without my blogging income. Making money blogging has enabled me to take a 50% pay cut and do work I love all while paying off my debt. First, I make money from advertisements on my blog. I have an ad agency that does the placements for me, so I don’t have to worry about the logistics (this is so nice!). I took one of the biggest ads off my site this month (the one that moved along the fold). It was so distracting to me, and I don’t want my readers to feel that way. Fingers crossed the ad income doesn’t drop dramatically from that. Second, I make money through affiliates. The easiest way I know how to explain affiliates is to use a fashion blogger as an analogy. When a fashion blogger promotes a dress she’s wearing and you click on the link to the dress and buy it, she’s paid a percentage from the sale. I started taking affiliate marketing more seriously when I took the course Making Sense Of Affiliate Marketing by Michelle Schroeder. This resulted in me implementing a strategic plan for growing my affiliate sales (something I’m focusing on this year). You’ll notice the most growth I’ve had on my blog has been from investing in myself. This was hard for me to do at first because the thought of spending money when I was trying to get out of debt seemed ridiculous. But then after hearing so many bloggers say it’s a must, I switched my mindset to one that embraced investing in myself if it meant the potential to grow in some way. So far, the courses have been worth every penny. A third way to make money blogging is freelance writing. I don’t do this anymore because I focus on my own blog instead of writing for other people’s blogs. But I’m including it because it was a huge part of me making money online during my first and second year blogging. Despite being a terrible writer, I was able to make money freelance writing pretty quickly. This is a great way to start making money on the side when you start blogging or if you are just learning how to blog but not making money yet. Check out Earn More Writing for more info on how to start freelance writing. There are other ways to make money blogging that I don’t use, like doing virtual assistant work or publishing sponsored posts. Because I want to scale, I am focused on affiliate marketing and digital products. I learned a specific strategy for making money blogging from Six Figure Blogger (the course I just took), and I feel relieved to finally have a strategy in place for creating digital products that people actually want to buy. I love making money blogging. Crazy to think that I started because of my student loan debt. Without my debt I wouldn’t be making money blogging. That’s why I’m so thankful for it. If you are reading this wondering if you can make money blogging, the answer is yes, you can. For a full look at each of these, read my how to make money blogging post. Tip 1 – Take your blog seriously and treat it like a business. You need to have a strategy for your blog. You can do this using online resources, like EBA or the Blog Structure Blueprint, or by reading books for bloggers, or watching YouTube, or something else completely. Just make sure you create a plan so your blog is professional looking and taken seriously. Images, design, font all matter a lot. Tip 2 – Start with the end in mind. Assuming your end goal for you is to make money blogging, you need to make all decisions under the umbrella of starting a profitable blog. This means you need to work backwards when deciding what to blog about. You should create “sales-centered” content (a term I learned from Create and Go in the course Six Figure Blogger). This means you should think of potential products you want to sell (digital products you’d create yourself or promote through affiliate marketing) and create content around them (blog posts and opt-ins). Create an editorial calendar (plan your blog posts) around potential products you think you want to sell. This is sales-centered content. Blogs that do this well are Making Sense of Cents, Create and Go, and Avocadu (all six-figure blogs). What bloggers usually do (and what I did until I learned this from this course) is create random pieces of content and try to monetize the content by throwing in affiliate links randomly. Don’t do this. If you can’t find your idea anywhere in your research, it’s a red flag that you should stop with that idea and come up with something else. Because you want to make money blogging, you should not start a blog about your life or how cool you are. People care about how your life relates to their life and how they can learn from you. You can (and should) intertwine personal stories in your blog, but only for the benefit of helping your readers solve a problem. Your job is to find out which problem you can help your readers solve with certain products and create content around that. Remember, your goal is to help your readers solve a problem they already have and are searching for. Figure out how you can do this and you’ll have a money-making blog. Tip 3 – Focus on providing value to your readers. You need to be the best in your field. Your blog has to be different and better than the competition out there. Don’t let this stop you from starting at a beginner level – just know you need to become a pro fast. Focus on creating content that your readers already want. If you always provide value in this way, then your readers will want to come back and buy from you. This is kind of like what Gary Vee talks about in his book Jab, Jab, Jab, Right Hook. But if you are spammy, you’ll have trouble monetizing at all. Tip 4 – Be authentic and show your personality on your blog. People will read your blog because of you. They want to see the real you and get to know and like you. Your personality is why they’ll come back. Your authenticity is what will get you massive, obsessed followers. And the more loyal readers, follower, and fans you have, the greater potential for making money. Typically, the bigger platform, the better. Do this carefully, though. Share stories about you as it relates to the topic that your readers care about. Don’t share random things about your life that are off topic if your goal is to make money from your blog. Tip 5 – Work hard and evaluate your progress along the way. Yes, you need to work hard. But it’s not enough to just work hard. You need to work hard then evaluate the results of your hard work. If you’re not getting your desired results, then you need to make changes to your strategy. Acknowledge what’s not working and try something new. The worst thing is to keep going and expect different results. Successful people measure results, not effort. Keep this in mind on your blogging journey. Tip 6 – Take massive action until you reach your goals. To be the best and be known as the best by other people, you need to take massive action. This is something I learned in The 10x Rule by Grant Cardone. You have to be everywhere when it comes to your blog’s brand (think of the big names like Nike, Walmart, or Amazon). It’s not enough to post once a day on Facebook, post twice a month on your blog, and have an email list of 400 people. You won’t make money with those numbers. You need to take massive action all the time (Cardone would say you need to take 10x the amount of action you think you need to take). Tip 7 – Invest in yourself. These courses are all amazing. 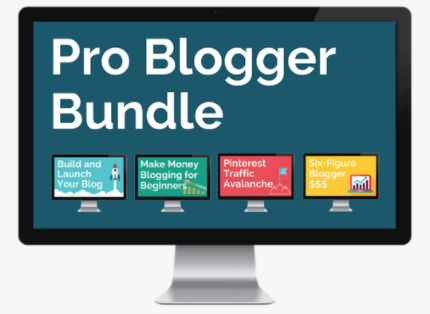 If you are ready to launch, grow, and monetize a blog, I suggest just going with the Pro Blogger Bundle, which combines 4 of the courses above. It’s the biggest bang for your buck. I am so thankful I make money blogging. It has allowed me to switch careers and cash flow my student loan payments. It’s taught me about business and entrepreneurship. I make money every month blogging, and it happened because I learned from other bloggers. This is such an inspiring story Natalie, thank you so much for sharing. The article is actually full of valuable resources and explanations for those who are willing to make that first step in their story and then do 10x the amount of action they think they need to take – in order to start earning. I agree with you that “Our primary reason for blogging is that we love it.” I have always been facing problems with Making Money and was trying to hire someone to help me. Yes, You blogging journey is so interesting. I also launch a blog site as a passion but still confused what to do the next and how to earn money, Have you any suggestion for me ???????? Hi Natalie! Thanks for sharing your blogging journey and tips that have helped you to be successful thus far. I’m starting out and have limited funds to invest in the programs that most money making blogger’s rave about..ie. EBA, Making Sense of Affiliate Marketing etc. I see you’ve invested in different courses from less well-known-to-me folks and I just wanted to get your opinion on what program you would use starting out to launch your blog if you had to choose one..EBA or Create and Go? Thanks! Create & Go is newer, so they’re less known (so far!). But I’ve taken all of their courses, and hands down if you are considering paying for EBA – pay for the Pro Blogger Bundle by Create & Go instead. You get four courses for less cost than EBA, and they are waaaaay more actionable. I’m talking a step by step guide in each one for actions you need to take. You’ll learn exactly how they created a health and wellness blog and earn full time incomes in under two years. It’s so good. Thank you so much for sharing this an inspirational article with us! I recently became a blogger and I love it!